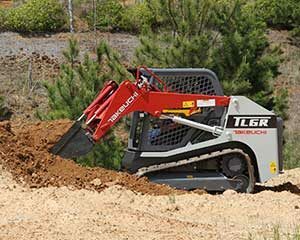 Takeuchi-US introduced the TL6 compact track loader (CTL) to its lineup. Powered by a Kubota 2.4-liter, 65.2-hp engine, the TL6 features a radial lift loader design with a maximum lift height of about 9.5 feet and a rated operating capacity of 1,841 pounds. It has a width of 5 feet, a height of about 6.5 feet and weighs 7,480 pounds with a canopy or 7,780 pounds when equipped with a cab. The TL6 also features a newly designed cabin with an overhead 5.7-inch color multi-information display and backlit rocker switches that control a variety of machine functions. Other available features include heating, air conditioning and a cab with a swing-out door. Additionally, the Takeuchi Fleet Management (TFM) system comes standard on the TL6. The TFM telematics system, which provides a variety of data points including machine health, condition, location and run time, is available during the TL6’s warranty period of two years at no additional cost.